I would like to share with you my thoughts and recommendations concerning a fundamental shift in how we define ourselves, as Officers, as enlisted Sailors, and as an Information Warfare Community. During my service, I have seen our community evolve and change many times, with attendant name and organization changes. Recently, we have begun another stage in our evolution with the re-designation of the Information Dominance Corps to the Information Warfare Community. And our TYCOM, as a result of this change, will very soon be announcing a name change for the cadre of Officers known currently as Information Warfare Officers. It is clear that this change must happen, as it is not inclusive of the community as a whole if only one portion of the Officer community is named in this way. But I submit to you that we as a community should not stop there. There are organizational changes that we can make concurrent with these changes that, In my opinion, will serve to better streamline our organization and more accurately describe us; as individuals, as groups, and finally, as a community. For Officers of the IWC, this change would not involve a great deal of change, with the following exceptions. First, I recommend that Information Warfare Officers be designation as Spectrum Operations Officers. I feel that this fully encompasses what we do while providing for some measure of OPSEC, in that we are not out and out advertising that we are in the business of cryptology, something that I feel we should do. Second, I would re-designate Information Professionals as Information Technology Officers. I think it is redundant to label any Officer as a “professional”. This is a given. All other Officers would retain their previous names. Where the Officers would not experience a great deal of change, such is not the case for recommendations involving our enlisted Sailors. First, I will address my recommendations for what should not change. I recommend that Intelligence Specialist (IS) and Information Systems Technician (IT) retain their names and rating badges, as they already accurately describe their mission set and skills. For the rest of the ratings, I recommend that rating names and, in most cases, rating badges be changed to reflect both the historical and current contributions to the Navy and the community. In the case of the CT ratings (CTR, CTT, CTI, CTM, and CTN), there is much in the way of shared history. These Sailors come from a long and proud heritage that got its start with the first spectrum warriors. These men and women pioneered the use of the RF spectrum to enhance our capabilities while reducing those of the enemy. In the beginning these professionals were labeled Communications Technicians, or CTs. Later, that name was changed to reflect an emphasis in Cryptology, changing to Cryptologic Technician. While these Sailors did, as our Sailors do now, forms of cryptology, it by no means covers the full breadth of the skills possessed by these professionals. It is for this reason that I feel the name Cryptologic Technician should be replaced, and a new rating name for each current CT rating be devised. I recommend the following changes, although I will note that my opinion is certainly not the only one to be considered. I feel that if these changes are approved, fleet input should be gathered to ensure buy-in. Cryptologic Technician Technical (CTT): Electronic Intelligence Technician (EW) – Revert to prior EW rating badge? Aerographer’s Mate (AG): Meteorology and Oceanography Technician (MO) – Keep AG rating badge? CWO2 Jason Tillman (former CTTCS) is currently attending IWBC in Pensacola, FL. He has served over 16 years as a EW/CT. Shipboard commands include: Spruance-class destroyer, Arleigh Burke-class destroyer, an Oliver Hazard Perry-class-frigate, and a Ticonderoga-class-cruiser. His shore commands include NIOC Colorado and Naval Surface Warfare Center Dahlgren Division. Wow, a second statement on this blog in a little over a month deriding the contributions and value of our CTIs. This one is subtle – leave intelligence in the titles of today's CTRs and CTTs but remove it from CTIs. What is it people in our own community think CTIs actually do with their linguistic / foreign language communication skills? Are CTIs not also Communications Intelligence Technicians? I don't think anyone intends to deride the contributions of CTIs. The greater CT community simply doesn't understand CTI work, nor does most of the 1810 community. Those familiar know CTIs likely do more cryptology and intelligence work, depending on language/mission, than the other CT rates. Indeed, it's tough to derive communications intelligence without linguists and their target knowledge. Not to speak for him, but I doubt he is hard over on renaming CTIs. I think the good warrant is simply trying to open the discussion. His perspective provides valuable focus on realigning IW community functions into something better than we have now. 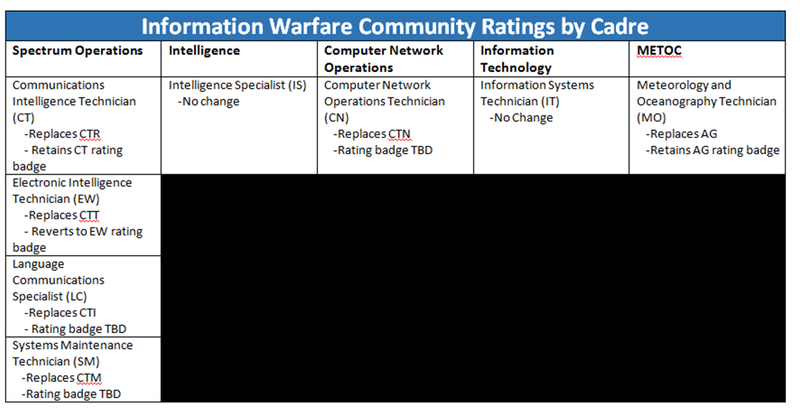 Based on what I've seen in this and other forums, several feel the 1810 community needs to split out its cyber folks from its DIWC/EMW/IO/SIGINT/all else folks either via forming a new sub community (as above) or giving functions to a different community. Jim, I have spent a good deal of time as a Chief (and I bet there will be more to come as a Warrant) working with CTIs. They provide enormous value to any mission that they are a part of, and are certainly deserving of their place within our community. I do not presume to take anything away from any of our enlisted Sailors, as they are all Information Warriors who contribute immeasurably to our missions. Something I do not think I did a good job of articulating in my post is that at the end of the day, if something like what I recommend above should come to pass, we should decide as a community, with specific input from the members of the ratings themselves, what they see as a good title and rating badge to represent them to the rest of the Navy. It is this “branding” that I seek to improve through aligning ourselves and our titles to better represent the breadth of our jobs. Think of the titles I use as more “placeholders” than anything else. The main point of my post is to point out that we can do a better job of aligning ourselves within our community based on our skills and missions, and if we should do so we should align everyone, Officer and Enlisted, by skill, by mission, and by name. I think there is a need to organize better to develop the professional and warfighting skills of the community and this offers a way towards that goal. By organizing as cadres, we will have better community management, and consequently better professional development. The challenge here is that there is tremendous crossover in all the work the various rates and officers of the community perform. For example, space and spectrum (which I think ought to include RF communications operations) affect the Navy's operational networks, which also need assistance from cyber for defense. Space and spectrum also affect our intel, EW, and IW capabilities and provide inputs to operations. There are similar crossovers in electronic warfare, SIGINT, and intel. Information Dominance© was supposed to address that problem by lumping the communities together. I think the difficulty there, was that we organized the people around the people (yes, you read that right). I think what's needed is some analysis of what work this gaggle of people actually performs, and organize the people around that work. Jason, I guess my point was, if the titles of our ratings are important, removing intel, cryptogology, COMINT, etc. from CTIs ignores the core of their mission. Language is a skill set much like morse code used to be for CTRs. The beauty of the current ratings in that we are all Cryptologic Technicians first, and speacilists in a particular skill set second. Making Language more prominent (Language Communications Specialist) just promotes attitudes like that expressed by Concerned 1810. In the past few years, there have been discussions of a single school on Corry for all IDC/IW enlisted ratings – a common core curriculum – before branching off to their particular specialty training. I think that is a good idea and, with training like that, we could just as easily have a single rating and manage our enlisted force by NECs. Hospital Corpsman is the largest rating in the Navy and manages their force like that. They haven't found a need separate their Sailors among some very disparate specialties, and I don't think our community needs to either. There is a lot of attention in the Navy right now on what are ratings are named. I think it's wasted time, and in this case, unless we change how we train and employ our people, it will be too. This is exactly the discussion I was hoping would happen: How do we move forward from where we are? I definitely see your point about the CTIs, and you make an intriguing reference to the HMs. It is true that they are a huge rating, one that encompasses a great many skills. But that way of doing things is not without its drawbacks. The FCs ended up splitting their advancement groups into Aegis and non-Aegis because the Aegis FCs were getting favored, for whatever reason. My point there is that we are different enough, in my opinion, that we should be separated. That isn't to say, however, that a common IW course for all enlisted is not a bad idea. If done right, that would play right into the idea of a common philosophy and knowledge set that applies to the whole IWC, not unlike the IWBC course I am currently attending. If it were me though, I would take that one step further and have a common course for all of the cadres I list above. One common course for Officers, one common course for enlisted, in each cadre. Since some of the cadres only have one enlisted rate, it would be easy for them. For us, I think it would take some doing to find the commonality, but once done, would be easy to implement. I agree with the concept of a Cryptologic 'Common Core'. CTI's don't (in a normal training path) go to Corry Station, the option is to send them there ($$$) or add it to the training they already received when they arrive at their first duty station following DLI; which since it would add training days to the course that also equates to money. CTIs do an incredible amount of (and highly valued) work. I do have concern that many CTIs are going the route (via their use by the navy and not through their own lack of trying) of being ‘linguists’ vice Cryptologic Technicians who understand and work with foreign voice communications. Linguists vs Cry Linguists is an important distinction. Middle Eastern target sets changed what we wanted our CTIs to learn (less technical and more global language) – a simple product of our national focus through the war years. Gone is the school at Goodfellow (which produced the best crypto linguists of any service); instead we have on site classes at the Big 4. I'm not sure the national mission focus of those courses provides sufficient learning to support service specific intelligence requirements (MIP, why we have P2). “The greater CT community simply doesn't understand CTI work”. This statement is UTTER nonsense.